Early in October, vicious wildfires raged throughout Sonoma County, destroying countless homes, and leaving lots of people without shelter. 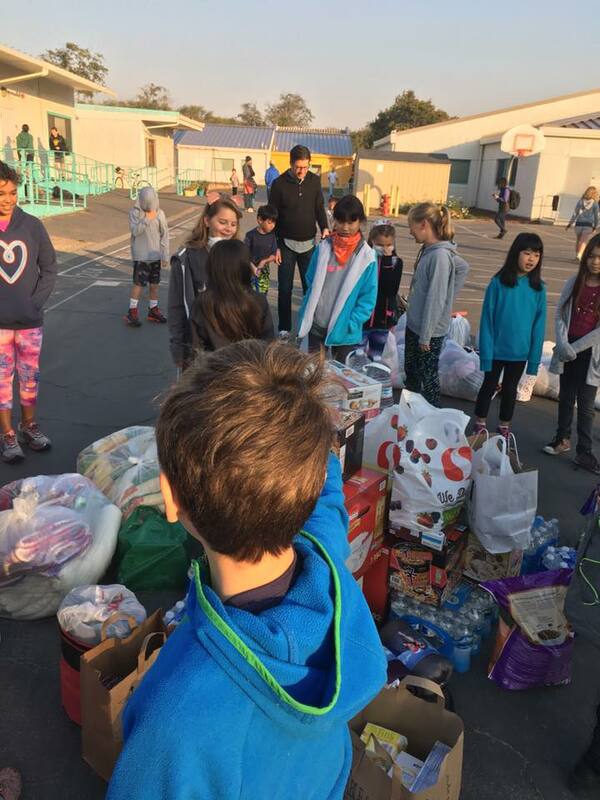 Mrs. Otieku’s class decided to join relief efforts by advertising and gathering donations for fire victims. The relief efforts were organized by The Local, a coffee shop on Park Street. Bay Farm School students and families gathered four carloads of donations, including blankets, baby items, and pet supplies. Many students’ families were affected by the fires, including 4th grader Molly Edison, whose great-uncle and great-aunt lived in the area of the fires, and 5th grader Tyler Lee, whose aunt and cousins were also affected by the fires. Many students helped support the drive by creating posters and hanging them around school. Fourth grader Ava Koppin said, “It feels great to be helping the community.” She and her friend Ella Foos created many fliers that were posted around school. Water, clothes, food, blankets, diapers, toothbrushes, shoes, pet supplies, photo frames, books, air mattresses, sleeping bags and lotion were collected and loaded into four cars at Bay Farm School on Oct. 6. The drive started in Mrs. Otieku’s class and quickly spread school-wide with donations coming in from kindergarten to fifth grades. Donations were collected for one week and the drive was very successful.